Xanthene Sayles Norris' career as an educator and her commitment to public service have earned her a legacy that commands recognition and respect. Born in Winston Salem, North Carolina, Xanthene S. Norris grew up and attended the public schools in Greenville, South Carolina. She earned a Bachelor's Degree from Clark College in Atlanta, Georgia, and a Master's Degree from Furman University in Greenville, South Carolina. 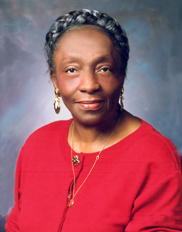 She is a retired educator, served as Greenville County teacher, high school counselor and adult education director. Presently, she is Greenville County Councilwoman, representing District 23, elected for five terms since 1997. Councilwoman Norris is Chairman Pro Tem of Greenville County Council. She currently serves on the Public Safety and Human Services Committee and on the Finance Committee. She is Trustee, College Ministry Chair and Personnel Chair of Springfield Baptist Church. Life member (Cluster VIII Coordinator 1987-1994) of Alpha Kappa Alpha Sorority, Inc., Peace Center Board, Past UNCF Upstate Chair and 2005 - 2017 Gala Chair/Co-Chair, 2017 Hall of Fame, Business 2016 Magazine. Her honors include Poe Mill Village Award, 2015; UNCF "A Mind is Gala Award", 2015; NAACP Silver Life Membership Award, 2014; Town Magazine, Charitable Giving Education Award, 2014; Senate of the State South Carolina Award, 2013; Athena Award, 2012; Living Longer with Class, SC Association for Medical Care, 2012; Clark Johnson Centennial, 2011; Department of Veterans Affairs Keynote Award Speaker, 2008; Talk Magazine 25 Most Beautiful Women Award, 2008; 107.3 JAMZ Public Community Award 2006; Greenville Drive Baseball Community Award 2006; Greenville Technical College Unsung Hero Award, 2005; Women Making History, 2005, AKA Regional South Atlantic Award, 2005; Greenville Chapter National Organization of Women Activist of the Year, 2003; Links, Inc. National Trend and Service Award, 2003; Rainbow PUSH Coalition Keep Hope Alive, 2003; AKA Sorority Cluster Coordinator Achievement Award, 2003; American Association of Women Honoree, 1998; AKA Sorority, Inc., 1994; Alpha Phi Alpha Fraternity Community Leader Award, 1993. Ms. Norris was Past Executive Director of Miss Palmetto Scholarship Program, and Chairman, A.J. Whittenburg Scholarship. She has been an annual Greenville Democratic State Convention Delegate since 1997 and was State Democratic Delegate to the 2004 and 2012 Democratic National Conventions. Because of her diplomacy, initiative, and determination to honor the legacy of Dr. Martin Luther King, Jr. Greenville County officially observed for the first time, the Martin Luther King, Jr. holiday on January 16, 2006 and as an ensuing National Celebration.